SJ Belangel is expected to spearhead Batang Gilas's campaign in the 2015 FIBA Asia U16 Championship. *This first appeared on my FIBA column on October 28, 2015. The future of Asian basketball will be on full display starting this week in the 2015 FIBA Asia Under-16 Championship, and I’ll be listing down some names we would all do well to remember. Since most of the players who will take to the hardcourt are going to be quite new, I’ve focused mainly on those who are sure to stand out — quite literally — because of their size. There are, however, a few guys who, despite not being the tallest, are expected to make a impact for their respective teams. Let’s begin with an obvious powerhouse, the defending champions — China. Coach Wang Jianjun has the biggest squad out there with an average height of 197cm/6ft 6in, and they are bannered by eight guys who stand 200cm/6ft 7in or taller. Wang Rui and Li Xiangbo are both 203cm/6ft 8in, while Zhao Yanman stands 205cm/6ft 9in. The biggest among them all, however, is 210cm/6ft 11in Zhu Rongzhen, who is also the tallest player in the entire competition. He is expected to be next in line to the likes of Wang Zhelin and Zhou Qi, who also dominated youth tournaments in their day. Without a shadow of doubt, the Chinese look to be the team to beat again this year. 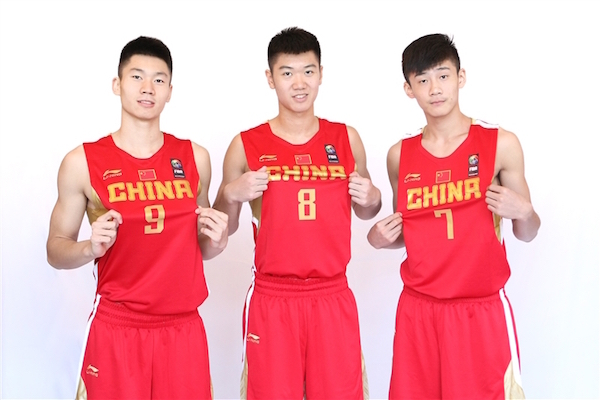 Left to right: 6'4 Bai Haotian, 6'7 Chen Baishi, and 6'6 Wang Junjie. 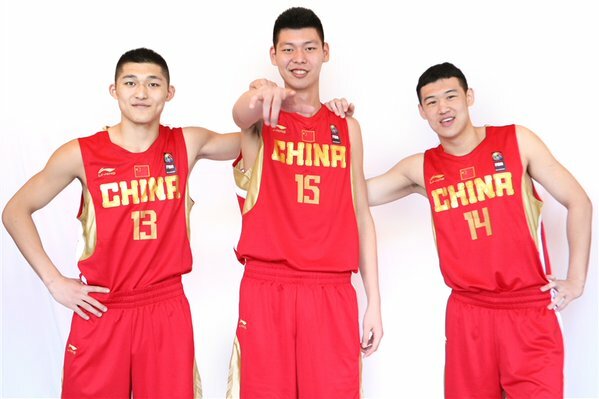 The new Walking Great Wall (left to right): 6'8 Li Xiangbo, 6'11 Zhu Rongzhen, and 6'9 Zhao Yanman. As for the team that finished runners-up to China in the 2013 edition, the Philippines will definitely face tall odds to repeat as podium finishers. Coach Michael Oliver’s wards clearly dominated in their Southeast Asian qualifiers, but they will be missing a few good players this time around, especially a pair of 192cm/6ft 4in guys in RV Berjay and Rhayyan Amsali. Without them, the responsibility of patrolling the middle will fall squarely on the shoulders of 193cm/6ft 4in Will Gozum and 182cm/6ft 1in Jonas Tibayan. Defensive specialist Gian Mamuyac (180cm/5ft 11in) is also one guy on whom to keep tabs, especially with those long limbs. The Philippines’ motor will come from guard SJ Belangel (177cm/5ft 10in), who once scored 99 points in a single game back home. That will certainly make him attract a lot of defensive attention. The Philippine frontline will be short on size but big on heart. 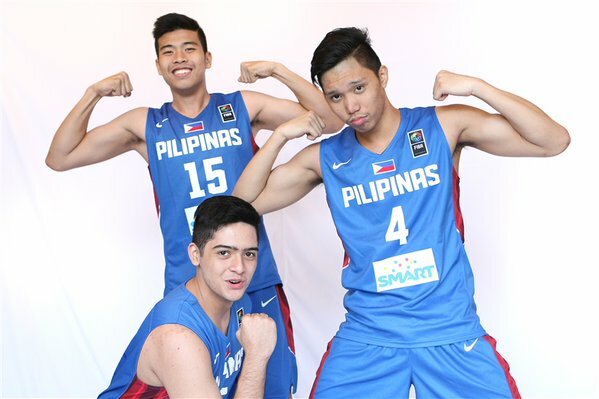 Here they are: #15 Will Gozum is 6'4, #4 Jonas Tibayan is 6'0, and (seated) Andre Flores is 6'1. Japan, third-placers in 2013, will also be a force to reckon with here. Two years ago, it was Rui Hachimura who spearheaded the Japanese charge to the top three, but this time around it’s his younger brother, Aren Hachimura (191cm/6ft 3in) who will take over along with team captain Taiga Kagitomi (192cm/6ft 4in). 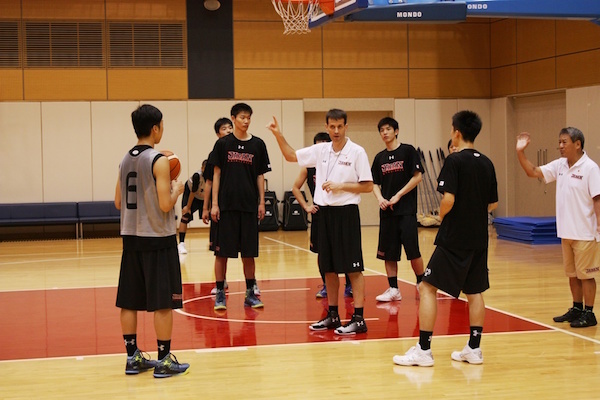 Coach Torsten Loibl directs training earlier this year in Japan. The other East Asia squads will be just as formidable as Chinese Taipei parades one of the tallest teams in the field. 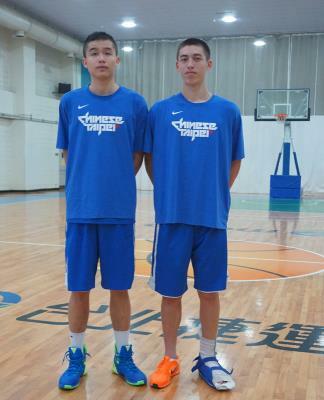 Twin towers Wu Pei-Chia (205cm/6ft 9in) and Jonah Morrison (202cm/6ft 8in) were expected to be coach Lin Cheng-Ming’s main weapons, but Morrison’s very recent foot injury has sidelined him for the duration of the meet. Wu, therefore, will have to carry much of the load, though he is expected to be supported by fellow big man Chen Fan Po-Yen (195cm/6ft 5in), the guard duo of Lin Yu-Chun (175cm/5ft 10in) and Chen Yu-Wei (183cm/6ft 0in), and streaky shooter Chen Yu-Jen (190cm/6ft 3in). 6'9 Wu Pei-Jia (left) will have to man the middle on his own as frontcourt partner 6'8 Jonah Morrison (right) is sidelined with a foot injury. 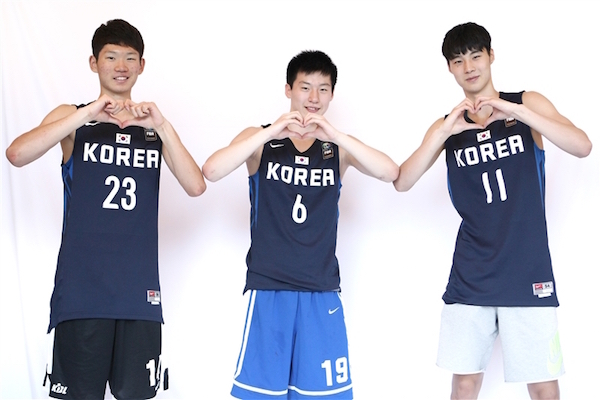 Korea, too, is a strong contender, especially with the talent and experience of 198cm/6ft 6in Yang Jae-Min, who is the only player here who also saw action in the previous FIBA Asia Under-16 tournament. That’s right, Yang is so skilled he first donned his country’s colors when he was just 14 years old. Needless to say, he is expected to break out in a big way in Jakarta after averaging just 4 points per game in 2013. Helping him out are 199cm/6ft 7in center Cho Hwi-Woong and speedy guard Lee Jung-Hyun (185cm/6ft 1in). Left to right: 6'4 Kim Han-Yeong, 6'1 Lee Jung-Hyun, and 6'6 Shin Min-Suk. Lebanon and Iraq are also teams worth mentioning. The Iraqis beat the Lebanese in the 2014 West Asia Under-15 tournament, and they will remain a strong threat to the favorites here, especially since 208cm/6ft 10in Mohammed Al-Okbi will be around to anchor the slot. Iraq is also notable for having three 14-year old players — Mohammed Abbas (178cm/5ft 10in), Hasan Al-Fahad (178cm/5ft 10in), and Mohhamed Hussein (195cm/6ft 5in) — who are definitely being groomed to be future bulwarks of their youth team. Lebanon, meanwhile, will be led by none other than star wingman Karim Zeinoun (188cm/6ft 2in), who just returned from the United States where he is now going to finish his secondary studies, while Joe Ziade (201cm/6ft 7in) looks to be the team’s main man in the middle. These are some of the names with which to be familiar, but more are bound to catch our attention as the 2015 FIB Asia Under-16 Championship commences. Host Indonesia hopes to spring an upset or two behind coach Eddy Santoso. 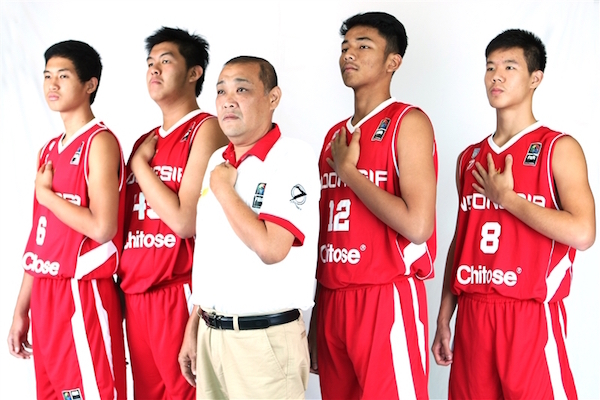 FOR MORE 2015 FIBA ASIA U16 ACTION, CHECK OUT OUR 2015 FIBA ASIA U16 ROUNDUPS! The FIBA website has some heights for our players wrong though (maybe by design?hehe, wrong info given?). Credo and Ildefonso are almost as tall as Berjay, maybe a shade smaller for Credo (almost 6'4") and more evident in Ildefonso (probably 6'2-6'3") but definitely NOT below 6'. Gomez de Liano should also be taller than the 5'11" listed but not so much. Lagumen, according to a Rappler article detailing the Palarong Pambansa, is a 6'6" slotman daw, no idea though if the writer just got the player wrong or something (but pretty hard to do when the name is written on the back). 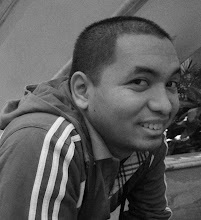 Tibayan on the other hand, some have said to be at least 6'4" rin. Check their heights in this photo. I’d rather put more trust on documents submitted by the SBP to FIBA Asia rather than photographs. Jason Credo, the Ildefonso brothers, the Berjay brothers, and Andre Flores are my regular customers every morning at the Ateneo HS because they come in late quite often. I know for a fact Credo and Dave Ildefonso are at least 2 inches shorter than RV, who is “around” 6’4 (maybe a shade under). It’s possible their height measurements in their documents (perhaps their passports?) did not account for any growth spurts they had in the last handful of months, but by and large these measurements are accurate. Gomez de Liano, like Harvey Pagsanjan, is around 6’0. Definitely not taller than that (yet). Lagumen is NOWHERE near 6’6. Not by a mile. He’s listed as 5’10 by San Beda HS. The Rappler writer maybe mistook him for the only 6’6 guy on San Beda’s roster — Germy Mahinay. How that happened I don’t know, but I’m 100% sure Lagumen is nowhere near 6’6. Tibayan also is nowhere near 6’4. Hell no. Closer to 6’1 and no taller. For sure. I watched these guys train this past summer in FEU Diliman and FEU Manila. I’ve talked to them, profiled them on another site, and have had conversations with Mike Oliver as well. I can attest that their measurements as they appear on FIBA’s site are reasonably accurate. ^In any case, the listed heights for the AHS boys were still wrong though, as both Credo and Ildefonso were listed 6'0" and below. I concede the points regarding Lagumen and Tibayan because I was less sure about them anyway. What was Berjay's injury nga pala? Will it affect him for the upcoming UAAP season? And in Amsali's case, why the hell did NU pull him out? Wala pa naman season ah. Nakakainis lang na the UAAP juniors season was precisely moved so that it won't coincide with these youth tournaments tapos hindi rin pala papayagan. Oh well, good luck to our boys! Hoping for at least a podium finish!